The peritoneal cavity is a closed sac lined by mesothelium. It normally contains a little fluid that allows the intra-abdominal organs to move freely. Some conditions that can affect the peritoneum are shown . 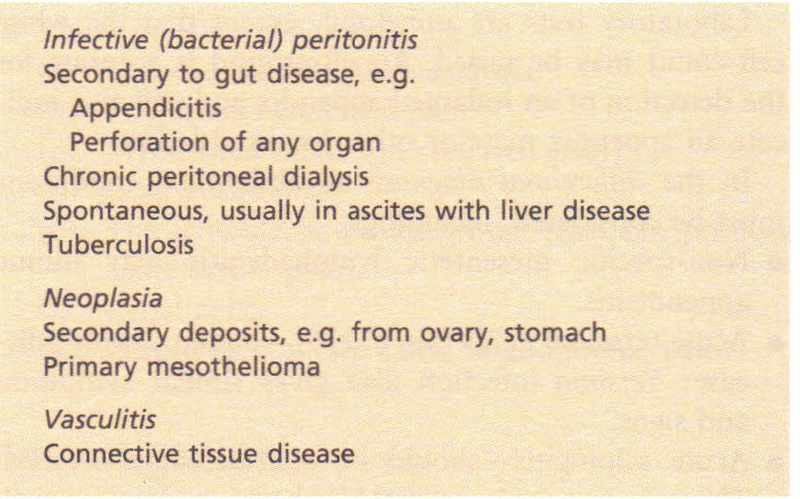 Peritonitis can be acute or chronic, as seen in TB. Most cases of infective peritonitis are secondary to gastrointestinal diseases but it occasionally occurs without intraabdominal sepsis in ascites due to liver disease. Very rarely, fungal and parasitic infections can also cause primary peritonitis, e.g. amoebiasis, candidiasis. Peritonitis is discussed further. The peritoneum can be involved by secondary malignant deposits and the commonest cause of ascites in a young to middle-aged woman is an ovarian carcinoma. A subphrenic abscess is usually secondary to infection in the abdomen and is characterized by fever, malaise, pain in the right or left hypochondrium and shouldertip pain. A plain abdominal X-ray shows gas under the diaphragm, impaired movement of the diaphragm on screening and a pleural effusion. Ultrasound is usually diagnostic. 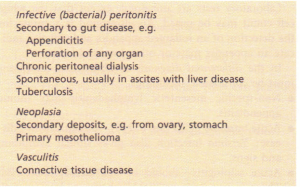 Ascites is associated with all diseases of the peritoneum. The fluid that collects is an exudate with a high protein content. It is also seen in liver disease. The mechanism, causes and investigation of ascites are discussed. This is due to reactivation of a tuberculous focus in the abdomen, often a lymph node. It is common in developing countries and is seen in the UK in debilitated patients, alcohol-dependent patients and in certain racial groups, e.g. Asians. Usually the onset is insidious, with fever, anorexia and weight loss. Abdominal pain is common, accompanied by ascites (75%) or an abdominal mass caused by an inflamed mesentery. Diagnosis is made by examination of the peritoneal fluid, if present, which shows an increase in lymphocyte count; occasionally tubercle bacilli are seen on staining. Culture of the fluid should be performed. Ultrasound shows mesenteric thickening and enlargement of lymph nodes. At laparoscopy the peritoneum is seen to be studded with tubercles that can be biopsied and sent for culture and histology. Treatment is with conventional chemotherapy for 18 months to 2 years. This is a rare condition in which there is a marked fibrosis over the posterior abdominal wall and retroperitoneum. The aetiology is usually unknown but it has been associated with the drug methysergide and occasionally with the carcinoid syndrome. The disease usually presents in middle age with malaise, fever and loss of weight. There is often anaemia and a raised ESR-a CT scan is diagnostic. The major complication is urinary tract obstruction from ureteric involvement, which may require surgery. 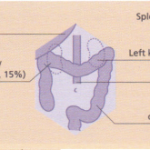 Further reading Bailliere’s Clinical Gastroenterology-quarterly reviews of gastroenterology. London: Bailliere Tindall. Field M et al. (1989) Intestinal electrolyte transport and diarrhoeal disease. New England Journal of Medicine, 321, 879. Gastroenterology Clinics of North America (1993), 22.
Review articles on H. pylori infection. Lynch HT et al. 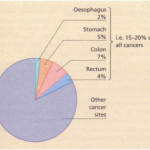 (1993) Genetics, natural history, tumour spectrum and pathology of hereditary nonpolyposis colorectal cancer: an updated review. Gastroenterology 104, 1535. Pathophysiology, Diagnosis, Management, 5th edn.